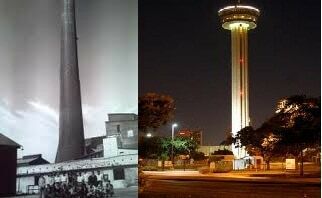 A Life Transition From a Mexican Coal Mine Chiminea to San Antonio’s Tower of the Americas. A Very Personal Profile of a San Antonio Bankruptcy Attorney, Part 2 - Law office of Jose Soria, P.C. To the left of the main boulevard you will come across the “Colonia Zaragoza”. As far as I know, it was probably named after a famous Mexican revolutionary figure. This Colonia is where my grandparents on my father and mother’s side lived. My maternal and paternal grandparents’ homes were about 4 or 5 blocks from each other. In the colonias, relationships and marriages seem to blossom within blocks of the couple’s homes. My uncle Raul married his next door girlfriend and raised a family of his own in a two room house behind my grandfather’s home. The Colonia Zaragoza is but one neighborhood or “colonias” located near the main boulevard; the “colonia sarabia”, the “colonia independencia”, the “colonia americana and others. The Colonia Americana was a neighborhood established during an era when an American coal company owned the mine in the area and developed the neighborhood for Americans living in town. A walk from the zaragoza neighborhood to the downtown area could take about 20 minutes, but less by bus. Growing up, the main boulevard was maintained for heavy vehicular traffic but not very attractive. Dust tended to blow in large clouds like you see in the desert scenes in the movies. It was customary to see people in the early morning sprinkling water outside their front homes, not to feed grass, since there wasn’t any, but to keep the dust from overtaking their homes. Every other road or street in the city was unpaved and covered with rocks, dirt and potholes. I remember playing soccer or running barefooted in the neighborhood and at times stumping my big toe, causing it to bleed. Later, when I visited the town in my early twenties, a drive thru the neighborhood felt like taking a detour onto a rocky river road. My maternal grandparents had 12 children that I got to know and 2 or 3 that did not survive their infant years. They are: Tio Epitacio, Tio Jose, Tio Raul, Tio Ricardo, Tio Rogelio, Tio Chuy, Tia Irma, Tia Cuca, Tia Licha, Tia Letti, Tio Arturo , and my mother . My paternal grandparents had 7 children; Tia Emma, Tia Dora, Tia Lile, Tia Pera, Tia Licha , Tio Tono and my father. Most of my uncles and grandparents on my mother and father’s side have worked in the mines at one time or another and some all their lives, retiring with meager pensions. Coal mining has long been one of the most dangerous industries in the world. Miners constantly risk personal injury due or death due to equipment failures or accidents, underground tunnel collapses, explosions and hazardous gases. When I was young, my grandmother’s brother lost his life in a mine explosion. It was a very difficult time for her and those around her. During his time at the mines, My grandfather Jose had an accident in the mines and lost his right thumb. He used to tell me that whenever someone needed a vacation, one way to get one was getting slightly injured on the job. Some would say to a coworker, I need a break to be with my family, “get me two weeks” or “I need four weeks” so, some would “accidentally get their hands smashed just a bid by the “mazo” or sledge hammer.